Today’s comment came from a busy professional. 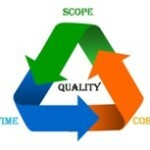 What separates the good, or the great, project managers (PM) from the just so-so? Problem No. 1: Team members not knowing or understanding what their responsibilities are, not owning their part of the project. Problem No. 2: Meeting deadlines. Problem No. 3: Scope creep. The PM is responsible for effectively conveying the project scope, goals and individual team member’s responsibilities. The best way to assure that your message has been conveyed is to ask each team member to paraphrase the goal and their part/responsibility/role in achieving the goals. They need to also paraphrase the consequences of not achieving the goals – not only for the company but for their careers as well. Depending on one-way conversations like email and memos will not assure that your team understands their role. Creating presentations and status reports does not fully verify the team’s ownership. Implementing one-on-one manager’s meetings will increase transparent communication between the employee and employer. Adding one-on-one project manager meetings with the various managers on the projects will do the exact thing for the project. 1) Keeps the clients involved and gives you early feedback on how your features are matching your clients’ expectations. The product needs to match the client’s need and not your design. You are building the product for the client’s use; therefore, it’s imperative that you get the clients’ perspective along the way. 2) Forces the team to work on the quality of the deliverables all along the way. 3) Can continually provide the clients with their minimum requirements (to get them moving forward on their tasks) while you continue to enhance the product for future releases. Another tool is risk management. There are various ways to manage risk. Risk Management and Risk Analysis incorporate contingency plans for high-probability/high-impact issues. Taking the time to visualize what “could happen” in the project, then sorting which items are most likely to happen with a high-impact to the project. Those items you put contingency plans in place. Training every member of the time on good estimation skills will have a profound effect on accurate schedules. I have an article and presentation on the 12 Tips of Realistic Scheduling To download the article, register HERE. Creating a Recovery Protocol Chart is also useful in meeting deadlines. The 12 Tips of Realistic Scheduling talks more about the Recovery Protocol Chart and Change Management in general. To download the article, register HERE. 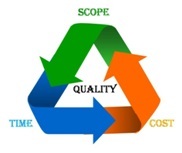 Change Management is the tool that you implement to eliminate scope creep. Once you have a well-defined feature set and requirement documents – any deviation of those requirements go through a Change Management process. CM outlines the consequences of the request including level of effort, resource requirements, delay in schedule, affect on other dependencies (identify any change reaction), quality issues or budget concerns. Once all these things are clearly outlined, the team can make a better decision in moving forward with the change. Creating a Recovery Protocol Chart is also critical in reducing Scope Creep. The 12 Tips of Realistic Scheduling talks more about the Recovery Protocol Chart and Change Management in general. To download the article, register HERE.